Majority of the Hindus insist on lighting a traditional wick lamp in puja room. This is because it is believed that the traditional lamp that is lit radiates heat and light energy. The regular movement of the flame in the traditional wick lamp is highly effective in passing out the positive energy. All this is not possible through the electric lamp, especially the zero watt lamps that is lit in front of the pictures of Hindu gods and goddesses by some. The wave movement that the traditional wick lamp has got is believed to help in distributing the positive energy on all sides. The best medium to light a lamp is pure cow ghee. Sesame oil, also known as gingelly oil or til oil, is considered to be the best to light the lamp and this is gain associated with positive energy that it gives out. 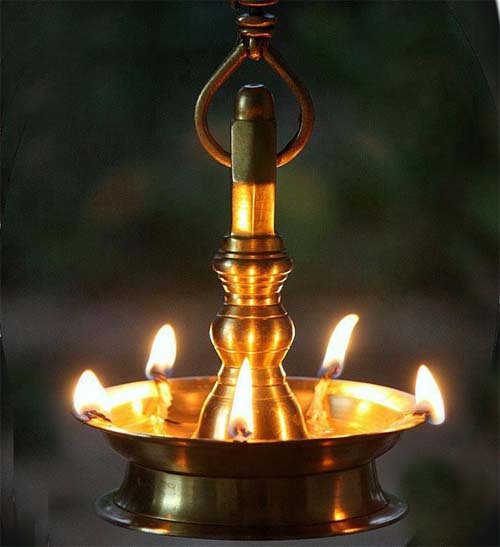 Lamps are also lit using numerous other types of oil today including coconut oil, jasmine oil, mustard oil etc. Such lamps are lit before a particular deity for a particular purpose. Apart from this there is also a symbolic meaning attached to the lighting of the traditional lamp. The wick in the traditional oil lamp symbolizes ego and the oil or ghee used symbolizes our negative tendencies. When we are lit by self knowledge, the negative tendencies (oil) melt away and finally the ego (wick) perishes. When the ego perishes, we realize that we are all the Supreme Truth.